All children need the right amount of sleep. It ensures good health and growth and good habits right from birth. That’s why routine is important. Without adequate sleep, children may have a lack of energy throughout the day. All kids are different and have their own internal patterns or requirements in order to function fully. Some may need more sleep than others. Babies and toddlers should be trained to know when it’s time for bed. When placed in a crib, they realize it’s sleep time. 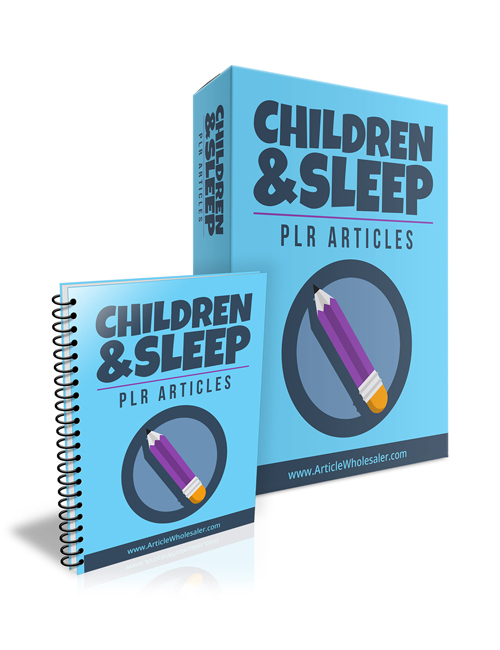 In this series of plr articles, you will learn all about it and more. You’ll understand the common problems faced by children and teens, how to deal with kids when they wake up from nightmares, handling bed-wetting, the importance of getting children onto a routine, reading the signs your child gives you when they can’t sleep, and much more. If you’re in this niche then this content will be a killer addition to your content for your readers to enjoy. Many people don’t realize the importance of sleep for their children. This content will certainly be a wake up call for many with kids. You’re in a position to be an educator. Hit the download button now.